Researchers Dr. Michael Kilgard and Dr. Navzer Engineer from The University of Texas at Dallas and University-affiliated biotechnology firm MicroTransponder report that stimulation of the vagus nerve paired with sounds eliminated tinnitus in rats. A clinical trial in humans is due to begin in the next few months. Described as a ringing in the ears, tinnitus causes mild irritation for some people but is disabling and painful for many others. The U.S. Veterans Administration spends about $1 billion a year on disability payments for tinnitus, said Kilgard, associate professor in the School of Behavioral and Brain Sciences at UT Dallas and co-author of the journal article. Tinnitus is a symptom some people experience as a result of hearing loss. When sensory cells in the inner ear are damaged, such as from loud noise, the resulting hearing loss changes some of the signals sent from the ear to the brain. 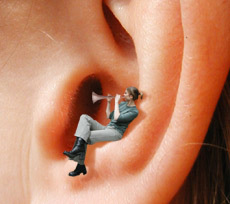 For reasons that are not fully understood, some people will develop tinnitus as a result. In addition, the neurons fire in sync with one another and they also fire more frequently when it is quiet. According to Dr. Kilgard, it’s these changing brain patterns that produce tinnitus, which is usually a high-pitched tone in one or both ears, but it may also be heard as clicking, roaring, or a whooshing sound. The researchers are, in essence, retraining the brain to ignore the nerve signals that simulate ringing. They monitored the laboratory rats for several weeks after therapy, and the improvements persisted. The National Institutes of Health (NIH) early in 2010 granted Kilgard and MicroTransponder $1.7 million to further investigate whether nerve stimulation offers a long-term cure for tinnitus. The first patient could be treated in Europe by early 2011, Engineer said. The initial set of human participants will have the electrodes attached to the left vagus nerve in their neck during a short outpatient procedure. They will come to the clinic Monday through Friday for a few weeks of treatment. At each daily session, they will experience VNS paired with sounds. MicroTransponder, a neuroscience based medical device company, was founded by UT Dallas PhD candidate Will Rosellini and sponsored by the school’s Institute for Innovation and Entrepreneurship. MicroTransponder is developing a less invasive wireless medical device to stimulate the vagus nerve. The UT Dallas/MicroTransponder team also is studying how best to optimize the paired therapy for tinnitus patients. Past research has shown that the severity of chronic pain and tinnitus is tied to the degree of plasticity in the brain’s cortex. A previous study showed that repeatedly pairing sensory stimuli with electrical stimulation of a brain structure called nucleus basalis generates powerful and long-lasting changes in cortical organization. Since the vagus nerve is easier to access for clinical use, and is known to trigger the release of molecules in the brain that promote neural changes, follow-up studies were performed on the vagus nerve. For the VNS study, the research team used a “gap detection model” to document tinnitus in rats that were exposed to loud noise for one hour while under anesthesia. Each of the noise-exposed rats used in this study exhibited a significant impairment in the ability to detect a quiet gap in a tone near their tinnitus frequency, but exhibited no impairment when the gap was placed in a higher or lower tone. When the rats were exposed to VNS paired with sounds, the gap impairment was eliminated — indicating that the tinnitus was gone. Today’s therapies for tinnitus have limited success and frequently must be modified over time because they become ineffective. “The VNS treatment would be an improvement over current therapies involving medications or counseling because it offers a possible permanent end to the condition and doesn’t appear to cause any significant side effects,” Kilgard said. Additional sponsors of the work include the James S. McDonnell Foundation, the Norman Hackerman Advanced Research Program and the Texas Emerging Technology Fund. The paper’s other authors were: UT Dallas neuroscientists Drs. Jonathan Riley, Jonathan Seale, Will Vrana, Jai Shetake, Sindhu Sudanagunta and Michael Borland. The article will be published in the Jan. 27 print edition of the journal. I am a tinnitus sufferer since 3.5 years. I wuold like to know, developments and applications on humans of vagus nerve stimulation. I will consider the application of treatment on myself. Best regards, Cengiz Savas. I SUFFER WITH TNNITUS 15 YEARS. I WOULD LIKE TO BE INFORMED OF YOUR PROGRESS FOR TREATMENT…..
of the most impressive properties in the country. they will discuss a gotten back dresser superbly distressed as well as altered to accommodate the kitchen sink. It may appear like ringing or somewhat whooshing in form. Electrical stimulation methods are another choice with the tinnitus treatment.